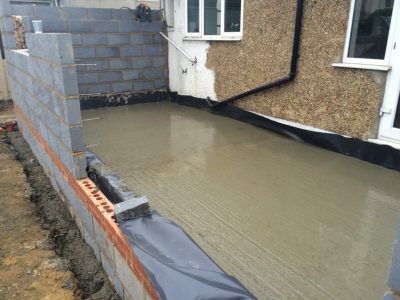 A typical extension job in Cheam, in 5 days we dug and poured the foundations, liaised with building control officer, installed a soakaway, and a new trap to pick up the new kitchen, then prepared and poured the over site, leaving the builder to crack on the following Monday. 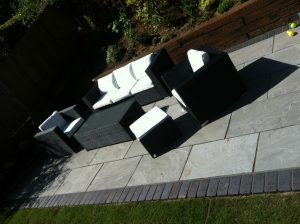 A minimum of mess and our efficiency kept his client happy. This wacky garden was designed by our client the home owner in Guilford. She cleverly used the small space to incorporate different finishes and keep the area interesting, note the Katzecure rollers we also installed around the perimeter to keep her cats safely contained in the garden..
Our brief for this job in Richmond was to create a simple driveway and garden area in two days on the tightest of budgets, so the owner could sell his home. 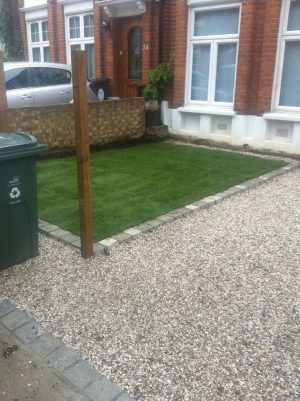 We accomplished this using a granite block edge, a white pea shingle on separation mats and a lush turf lawn. The house sold on its first viewing, we are told the new owner loves her driveway. A new build next to the Thames river. 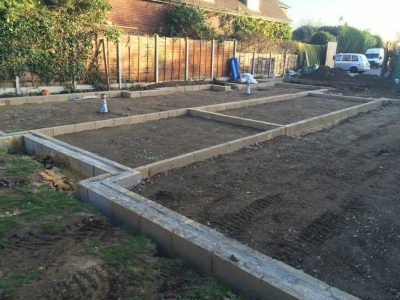 We demolished an existing bungalow and carried out the foundations for a new house which was to be the owners dream house, we had limited room at the front of the site so tight schedules and reliable muck away operators were key.. 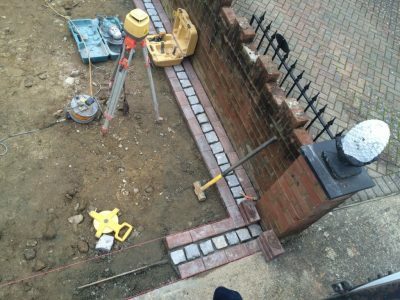 Installing a block pavoir driveway in Crawley, West Sussex. We wanted to make the work stand out with a rarely seen granite sett border. 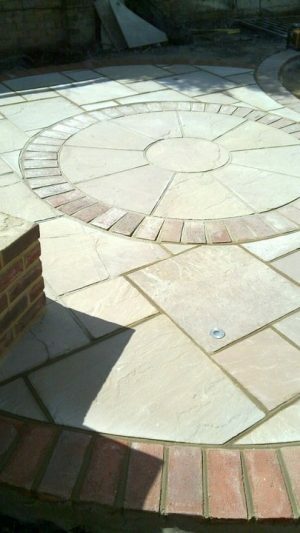 A rear patio in Purley, Surrey. 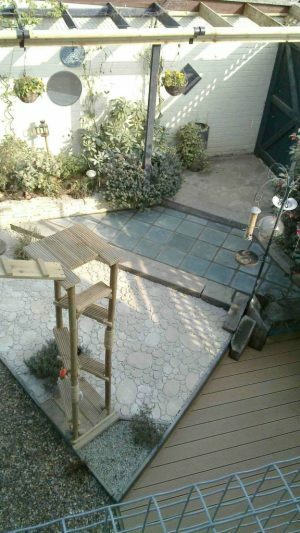 After constructing a sleeper wall to retain the flower bed to rear, we laid a Khadla grey sandstone with a Staffordshire blue brick border. 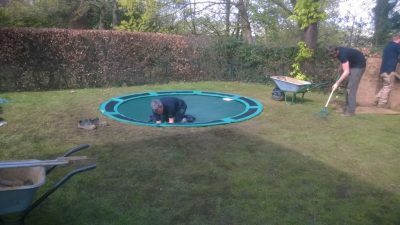 A rather unusual installation of a sunken trampoline in a client’s garden in Haywards Heath. We left that job and two kids grinning like Cheshire cats! 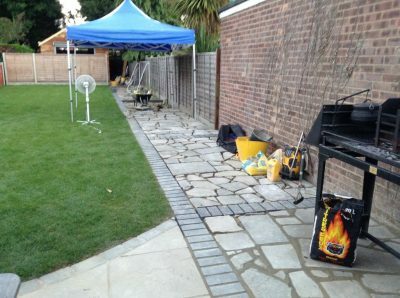 Installing a reclaimed York Stone crazy paving in East Grinstead. In hot weather any shade helps. The BBQ was lit an hour later! 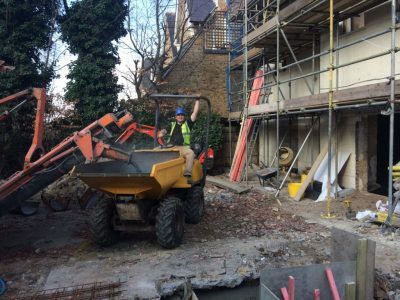 Dan on our small high tip dumper pouring concrete for footings on a large extension in Fulham. Designed professionally for a client in Streatham, we installed this great design with ground lighting.